Oh, dear. Did you hear what happened to poor old Allan? No? No you didn't!!!! Then if I was you, my friend, I would quickly switch on the following 73 minute movie made in 1970. It was Directed by: Curtis Harrington; and Starred: Anthony Perkins, Julie Harris, Joan Hackett, with Kent Smith. My God! Wasn't it horrible? Wasn't it really-really horrible!! 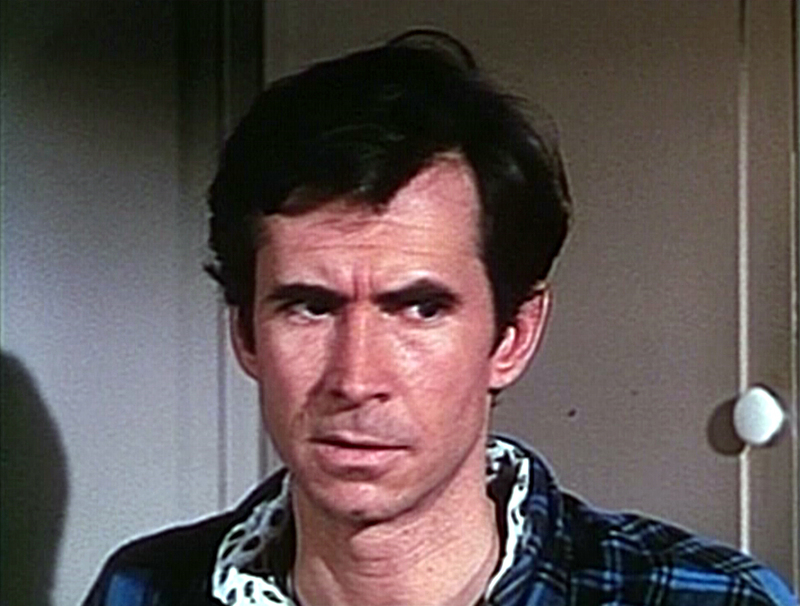 Allan (Anthony Perkins)! Oh, Allan! Open up this door for me please. Come on, man. Open up. Because how else am I supposed to help you unless you open up this door and tell me what's going on? I mean, are you hiding yourself away because you've lost your vision since we had that freak fire in our family home? Are you frightened because you're unsure about the true nature of our new lodger? What-ever-his-name-is! Or could your concerns be directed elsewhere, perhaps? Like some past forgotten tragedy? Or something else you've managed to push right back to the recesses of your fragile mind? Still no answer, eh Allan? Oh, dear. I don't know what to do with you sometimes. Day in, day out, you fumble around our family homestead like some stray animal. Wondering what's happening to those around you from one moment to the next. And now, we've finally got some time together, for some strange reason you've gone off to your bedroom without a care in the world. Then again, that's most probably why what next transpires taps me on my shoulder when my neighbour Olive (Joan Hackett) says to me, 'Hey, Katherine (Julie Harris). Maybe Allan just doesn't want to talk to his sister today?'. As a blind man is feeling rather blue - a dream sequence makes a poor boy choose what to do - pass me the hammer please because I want to knock in this screw - and at the end of the day, a sister needs to sit down and think things through. 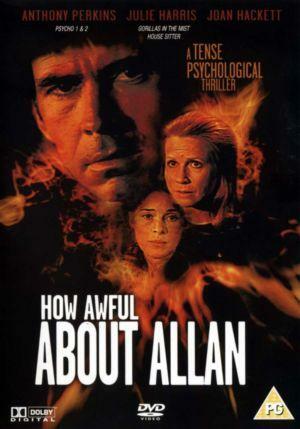 Essentially 'How Awful About Allan' is a physiological thriller about a sad and lonely man whose lost his vision in some freak fire, and afterwards is concerned why his sister has allowed a lodger to stay in their own home. Of course, this being a TV based production as well; you can also expect to see the usual seventies styled set's complemented with a whole host of mundane visuals. Not that this is a bad-bad thing, dear reader. But let's face it. Star Wars this film isn't. In fact, the only real way I can describe it to you is to say that it's one of those stories that kept me wondering what the hell was going on with its main lead -- as played by Anthony 'Psycho' Perkins. You see, from my perspective the main crux of this film was told from Anthony's view point. However, my only problem with this is that I couldn't really understand where he was coming from, from one moment to the next. In one scene he was happy. In another scene he was sad. In the scene after that he was crazy. And this emotional turmoil -- although somewhat justified in places -- did make me wonder if what he was going through was really true or not. Again. Not that this is a bad-bad thing. Yet if this movie wanted us -- the audience -- to engage with Anthony's character -- which I'm sure it did -- I'm afraid to say it failed at doing so because how can anyone engage with a man whose mind is all over the place? Know what I mean? Now something else about this thriller I wasn't too keen on was how it kept on blurring the screen whenever it wanted to show us what Anthony was gazing at. In my opinion even though I understood why the makers of this movie applied this sort of stylisation -- especially since his character can't see properly -- as push comes to shove I felt that it never really lent itself to telling the actual story-line, or making us sympathize with his arduous plight. Having said that, though, I can't attribute any of my negative comment's towards Anthony's performance. The way I see, folks, is that he did the best job he could with what he had at hand. And to a certain extent I can say the exact same thing about Julie Harris and Joan Hackett's performances -- because they too helped support this sad tale with their obvious more supporting roles. Anyway. I'm sure by now you've got the basic gist of what I thought about this fairly so-so film. So how about we all now sit back, relax, and check out the following filmic-facts. (1) The 'ABC' television network first broadcast this production in America on the exact same day President Nixon ordered one thousand new FBI agents to safeguard the local college campuses. It was on the 22nd of September, 1970. (2) Loosely translated, this project was entitled 'Psycho 2' in Italy; 'Invisible Threats' in Sweden; and 'Vengeance Offline' in France. (3) The production company behind this project, 'Aaron Spelling Productions', have produced such television programmes as 'Dynasty', 'The Colbys', 'Hotel', plus many-many more. (4) Anthony Perkins had to be led onto the set by a member of the crew whilst he was making this thriller, because he had 'special contact lenses' made that he could hardly see through. (5) Quick question. If this flick was supposed to be set in the dead of winter, how come the grass, the trees, and the bushes all look green? Hmmm? Visual gaff methinks. (6) According to the studio, the entirety of this movie was shot in just ten whole days. (7) One of the taglines used to promote this picture, was, 'Allan, Wouldn't You Be Better Off Dead?'. (8) After this adventure jumped into a coffin, Anthony Perkins starred in the crime-drama, 'Someone Behind the Door'; Julie Harris starred in an episode of 'The Virginian'; and Joan Hackett starred in the TV-movie, 'The Other Man'. 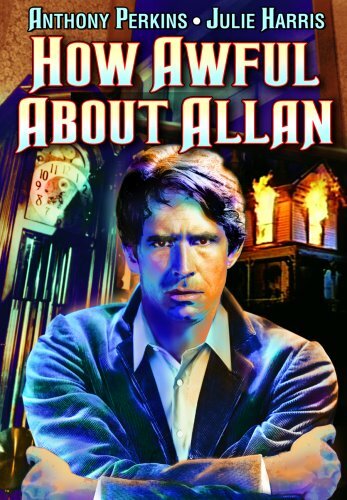 Overall I'd say 'How Awful About Allan' was a fairly middle of the road thriller which could have been a lot better than it ultimately was. Even though it had a fairly intriguing premise to work off of -- plus a couple of pretty decent actors -- what let it down the most was its dodgy centre and a story-line that didn't know if it was coming or going!